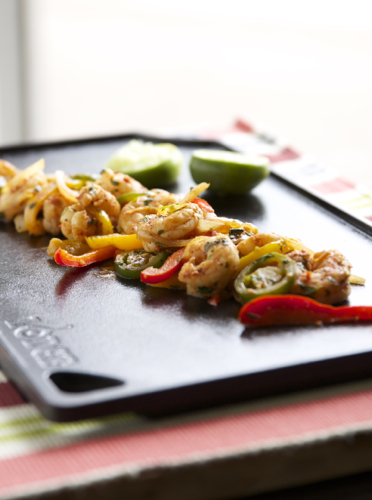 Kick off your summer with these amazing Shrimp Fajitas, you will never eat fajitas out again! Summer is here and with this heat the only types of food I want to eat is light, fun and flavorful! 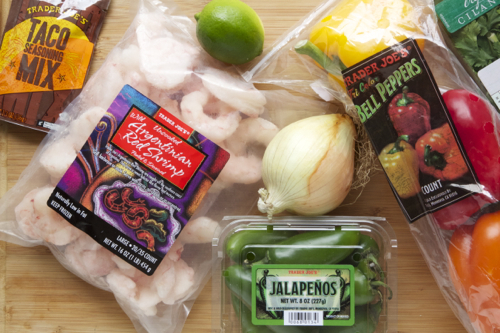 I always have a bag of frozen shrimp in my freezer just incase we have one of those “I don’t feel like eating out or ordering” nights. I have to say it is a lifesaver at times! I totally suggest you do it. Anyways, I think I have emphasized before how much I love Mexican food! 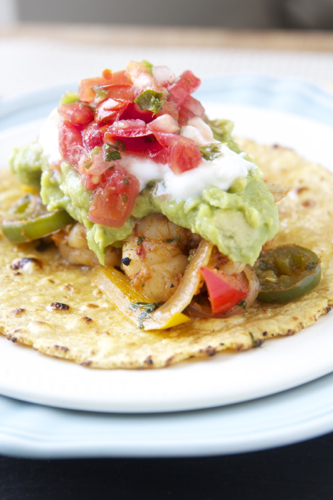 Anything in a tortilla is the best thing on earth! 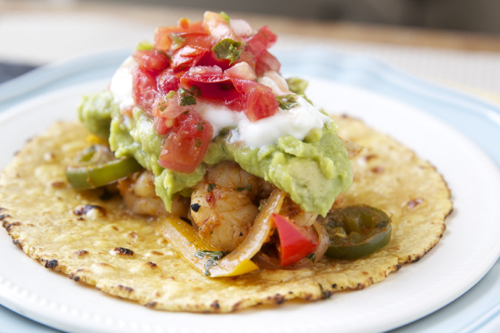 With that said, you know I had to share my favorite Shrimp Fajita recipe with you all! 1. Heat 1 tbsp of oil in a large sauté pan over medium high heat. Add the onions and sauté for 4 minutes. 3. Toss in the minced garlic, salt and pepper and continue to sauté another minute. 4. Remove the onions & peppers from the pan and set aside. 5. Add 1 tbsp of oil into the same pan over medium high heat. 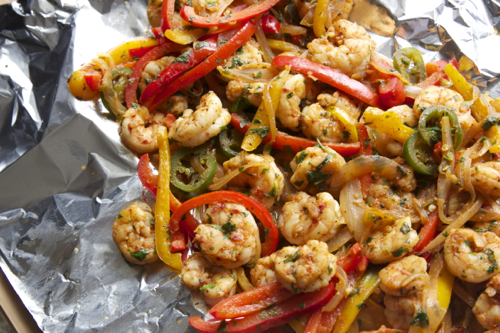 Add the shrimp and taco seasoning to the pan and sauté for 2-3 minutes, until shrimp is cooked though. 6. 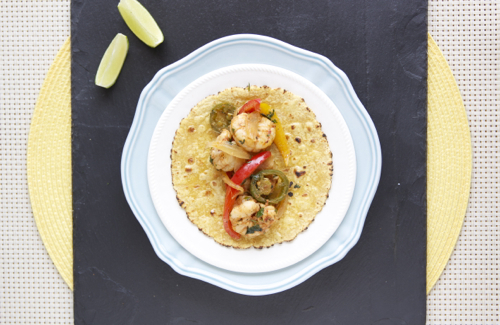 Place the onions and peppers back into the pan along with the chopped cilantro and lime juice. 7. Season with a pinch of salt and pepper and cook for 1 minute until all the flavors combine. 8. 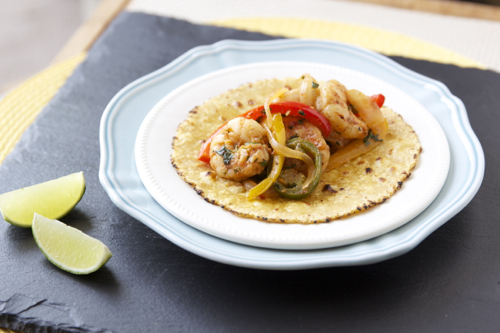 Serve with corn or flour tortilla and desired condiments. *The spiciness from the jalapeños may cause you to cough, I suggest you turn on the vent! I used this recipe yesterday and my boyfriend and brother couldn’t get enough. I also used your recipe for the Pico de Gallo. It’s a fast and easy dish to make and I’m looking forward to going home and eating the leftovers :)!